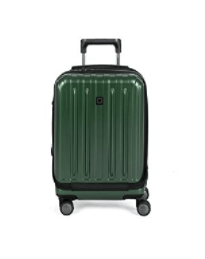 Delsey Helium Titanium is a 19-inch expandable spinner cabin suitcase that meets all international airline luggage allowances for carry-on bags. It is quite a popular product with almost 140 customer reviews on Amazon.com and scores 4.3 out of 5 stars despite being a fairly new release. It is an imported piece of luggage that is shipped quickly via Amazon.com. You have five colors to choose from, which are black, silver, purple, navy and hunter green with purple 4 dollars more and silver 18 dollars less than black, navy and hunter green. They have a scratch-resistant matte finish, look sleek and modern and different colors will be easier to spot on the airport carousel when you arrive at your destination. Delsey Helium Titanium is made of very strong 100% PC- polycarbonate material which is a sturdy plastic that is used in bullet-resistant windows and plane canopies and makes the luggage lightweight and durable and has fabric lining inside. It is resistant to impact and reported to resist bad treatment like being thrown around by the luggage staff at the airports. This cabin bag is easily maneuverable with the quiet perfect roll double spinner wheels and the ergonomic and the integrated solid telescoping handle. It measures 9.75 x 13 x 19 inches (22 x 14 x 8.5 inches including wheels and handles) with a good amount of space inside. And you can expand the capacity by unzipping through the middle so you have a bit more space and flexibility for packing your clothes and other items. Being an international size carry-on that meets the global air travel requirements it is a little smaller than the standard cabin suitcases. But it will still not fit under the seat in front of you on the plane and needs to be put in the overhead locker above you. There are two main compartments with a zippered divider on one side and the cross tie-down straps on the other side as well as small and large mesh pockets for your smaller stuff. There is a detachable privacy ID tag for when you lose your luggage. 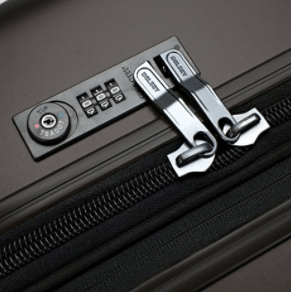 The built-in recessed combination lock that you see in the product photos is TSA approved and TSA staff at the airport will be able to open your luggage for checking the contents without having to break the lock. There is even a big zipped pocket at the front with a padded laptop sleeve that can fit in up to 15.6-inch size machines. It opens towards you rather than to the side and you can access the contents easier when in the overhead locker. It has a rather large and stable base thanks to the off-center wheel axels. The trolley handle does not look thick and solid but is reported to be quite sturdy and durable, and you can put a computer bag or other small bags on it easily. It is not a cheap suitcase but a rather stylish, functional and durable one that is worth the price.